Hi friends, if you want to learn which device(AlterEgo) creates the Researchers which can hear your internal thoughts or voice, then you are is in a right place. In this article, we will discuss about “Researchers develop a device(AlterEgo) which can hear your internal thoughts or voice”. Recently, Researchers have created a valuable device which can read people’s minds i,e what’s going on your mind or we can say that, what are you thinking. When the person thinks about anything then this device automatically tells what are you thinking without any speak. 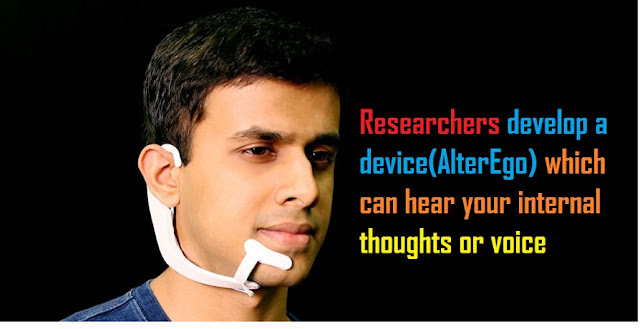 The name of this device is AlterEgo, which can transcribe the words that you are thinking on your mind and all this process is done internally but you do not say anything from your mouth. This device(AlterEgo) using electrodes which can attached to the skin. Arnav Kapur, who led the development of the system at MIT’s Media Lab which stands for Massachusetts Institute of Technology said that “Our idea was just to create that device which can hear your internal device and as a result of this we made this device. Arnav Kapur describes that this headset is an IA device which satnds for an Intelligence-Augmentation, and we presented this device at the ACM which stands for Association for Computing Machinery’s and is located in Tokyo. We wear this device(AlterEgo) around the jaw and chin which can clipped over the top of the ear to hold this device. In this device, we carried four electrodes under a white plastic device which can make contact with the skin and the working of this device is that, it can pick the neuromuscular signals which can triggered when a person thinks internally. If someone is thinking anything inside their head, Intelligence-Augmentation which is placed inside this device, it can match this particular signals and converted into the particular words and feeding signal or words into a computer. After this, the computer can integrally respond through the device with the help of a bone conduction speaker which plays the sound into the ear without any earphone. This device also leaves the wearer to hear the other voice of the world at the same time. Pattie Maes who is a professor of Media Arts and Sciences at MIT said that “As we all cannot live without our cellphones, but sometime, the use of cellphones is very disruptive. Arnav Kapur said that, when we carried the trial of this device(AlterEgo) with the use of 10-person and about 15 minutes of time. This AlterEgo device can having an average of 92% transcription accuracy. If we talk about its accuracy in percentage then this device holds 95% of Accuracy. Arnav Kapur also said that, we will improve the accuracy of this device and now Kapur and his team are currently working on this device(AlterEgo) to improve the accuracy of this device. The essential goal of this device is to make an interfacing with AI assistants such as Google’s Assistant, Amazon’s Alexa and Apple’s Siri from where it will allow the people to communicate with them and talk with them silently. There is only one disadvantages of this device which carried that users will have to wear this device and strapped to their face. But MTI experts said that, this technology has much potential and is helpful in lots of industries and companies. So friends in this article, i told you Researchers develop a device(AlterEgo) which can hear your internal thoughts or voice, Why Researchers have created this device(AlterEgo), Goal of this device(AlterEgo), and Disadvantages of this device(AlterEgo). But if you got any problem or if you have any query then put your question in comment section we will reply as soon as possible and also share this article with your friends and family and also follow us on your social networks. ← What is Instamojo? | How we use Instamojo?